With so many people asking me about bitcoin, I thought I would give my opinion. 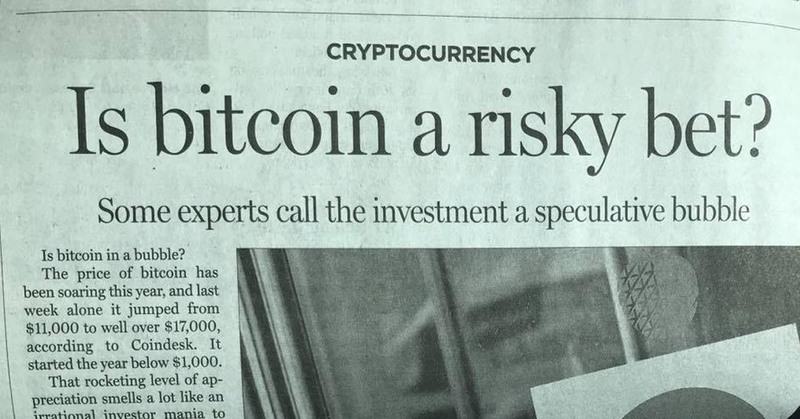 First of all, I have a small investment in bitcoin up 300 percent. Original investment No more than one percent of my portfolio. Original bitcoin investors say it’s going to 1 mil per coin. People who missed it call it a bubble. I call it a millennial investment based on no fundamentals. It’s definitely anti-establishment. Now the whole concept of cryptocurrencies is not new and they have blown up before. The concept is a software program that will bypass banks and other clearing houses. So a financial ledger of component suppliers would be paid upon sale of the product without going through banks, a supply chain clearinghouse with a transaction log or blockchain. The problem with this software is no big companies are using it yet so it’s conceptual. It has a long way to go on executing this promise. There are no rules or regulations on taxes, payment or money laundering rules, so there could be a huge illegal market in the making. The investment is ultra-hyped and is just like investing in a start-up software company. A big positive is this thing has huge momentum and in the technology world that is what it takes to build this thing out. Today bitcoin has begun trading on multiple platforms and even futures long side only no short selling Can be found. The other problem is no consistency in pricing bitcoin and ultra high fees to buy or sell, or margin which I don’t recommend. Also, today some companies are taking payment in bitcoin on a very limited basis but only as currency, no blockchain services. If you are wondering what to do it’s probably too late, but if you want to put something small to participate then go for it. Please don’t mortgage your home or bet the kids college fund. Remember it’s unproven software at this point and no real volume or use and no regulations, taxing, or anything has been decided. I call it millennial bc I have kids who graduated from college who expect to be millionaires upon graduating wo putting in the work. It could happen but there needs to be a whole lot more work. Hope this helps.